Just over five weeks since losing her baby girl in a tragic drowning death, Morgan Beck Miller has spoken out at length about raising awareness for water safety and how she hopes no other parent will have to go through what she has endured in recent weeks. "It's been 37 days since I've held my baby girl," she wrote on Instagram. 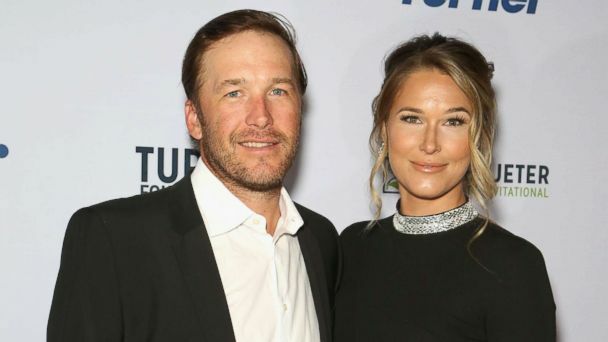 The volleyball star and her Olympic skier husband Bode Miller announced on June 11 that their 19-month-old daughter, Emmy, had died in a drowning accident at a neighbor's house. "I pray to God no other parent feels this pain," she continued in her Tuesday post. But Beck Miller continued her post by raising awareness and thanking a fellow mom for sharing a similar story, having also lost her young child to a drowning incident. "My heart is with you @nicolehughes8 as we walk this journey together. And thank you @scarymommy for helping us spread awareness," she added. "Drowning is the NUMBER ONE cause of death in children ages 1-4 ... It takes SECONDS. Please share and help us spread awareness. It's the first step to preventing these types of tragedies. #drowning #drowningprevention #truthaboutdrowning." In Beck Miller's Instagram bio, she linked out to Nicole Hughes' story in the Scary Mommy blog titled, "My Toddler Drowned This Summer, And Here's What I Want You To Know." In the piece, Hughes gets personal, writing, "We were never supposed to leave our beach vacation early to plan a funeral for our 3-year-old son. And, yet, within the course of one week, we had driven to the beach, returned without him, and held his funeral." The death of her son Levi took place around the same time the Millers lost their daughter. "How could I have known that every parent's worst nightmare would be my reality? It happened so quickly," she writes. "I was the one who found him, face down, in the deep end. Just moments before this horrific discovery, I split a brownie with him." In the piece, she adds statistics and details about how silent and fast a drowning death can be for a toddler. "This is a LEADING cause of death, and it is 100% PREVENTABLE," she added. "You can read more about my mission (and about designated supervision) at www.levislegacy.com." Water-safety experts told "GMA" last month that one simple solution to keep your kids safe this summer is to always have a water watcher on hand, somebody who stands next to the pool and is constantly scanning the water for any signs of distress. The water watcher can be rotated every 15 minutes or so, should know CPR, has a working phone and is alert and not under any influence.